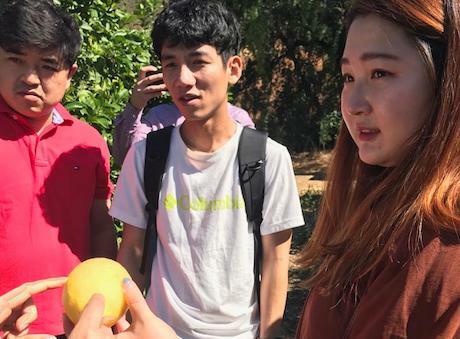 Last week, the people responsible for purchasing fresh fruit for E-Mart, the largest retailer chain in South Korea, visited lemon orchards in the area of Curacavi. During the tour they were told about the coordinated work that the Citrus Committee carries out in the citrus sector regarding: research to increase the products' quality, dissemination and transfer activities for producers and exporters, and promotional campaigns at the international level. They were also informed about the lemon and orange varieties available in Chile, and the dates each of them were available. The representatives of E-Mart said Korean consumer liked lemons that were very juicy and had a low acidity, such as the pink lemon that they have imported from the US, which has had a great reception among Korean consumer, thanks to its mild flavor. The E-mart supermarket is the number one discount store in South Korea and belongs to the Shinsegae corporation. It was the first department store in Korea and was founded in 1930, marking the beginning of the distribution industry in that country. E-mart was founded on November 12, 1993 by Shinsegae as the first discount retailer in South Korea. Currently there are more than 160 E-mart stores across the country, with a total sales volume that exceeded US $9.4 billion in 2009. With the opening of new stores and the acquisition of Wal-Mart Korea in 2006, E-Mart enjoys its retail leadership in the discount store category. In addition, it offers a wide variety of products, from food to clothing and diapers. Additionally, E-Mart has a website where consumers can purchase or view products online. The great challenge of the corporation is to reach the Chinese market with the aim of becoming one of the leading global retailers. During the 2018 season, Chile exported 3,900 tons of lemons to South Korea, i.e. 18% more than the 3,200 tons it shipped there in the 2017 season. In the 2018 season, Chile sent 1,624 tons of oranges to Korea, that is 47% more than the 866 tons of oranges it sent to that market in 2017. During 2017, South Korea imported a total of 141,570 tons of oranges. It's main supplier was the US with 131,675 tons, which accounts for 93% of that country's total imports. In that same period, South Korea imported 16,234 tons of lemons. 76% of them were imported from the USA, (12,399 tons). Chile was the second biggest supplier of lemons with 3,220 tons, i.e. 20% of total shipments.